Two things set the Cotswolds apart from England’s wonderful array of rural escapes and tourist destinations. First, it is England and Wales’s largest Area of Outstanding Natural Beauty (AONB) – an award bestowed upon the Cotswolds in 1966 – stretching from Chipping Campden in the north to Bath in the south. Secondly the buildings found here – both old and new – are built almost exclusively from the honey-coloured limestone found in area, giving the architecture a unique aesthetic appeal. While the spa towns of Bath and Cheltenham and the characterful towns of Cirencester, Malmesbury and Stroud are excluded from the AONB, what have come to epitomise the Cotswolds are its delightful villages and market towns, such as Burford and Broadway, Stow-on-the-Wold, the Slaughters and Moreton-in-Marsh – each of which has a mellow, timeless beauty. Despite their similar appearance, each town and village here has its own distinct character and story that stretches back hundreds, if not thousands of years. Across the AONB Iron Age hillforts, Roman ruins and Norman castles stand like silent guardians over sweeping landscaped parks, formal gardens and arboretums. Chipping Campden, a charming old wool merchants’ town at the northern tip of the Cotswolds, is one of the busier places within the AONB. With annual music and literary festivals it is a town proud of its cultural heritage – which is evident in the Court Barn Museum, celebrating the town’s Arts & Crafts credentials thanks to former resident C.R. Ashbee, who set up his Guild of Handicrafts here in 1902. The quirky side of Cotswold life can be seen here too. Overlooking the Vale of Evesham, nearby Dover’s Hill hosts the annual Robert Dover Cotswold Olimpick Games, an unlikely predecessor of the modern Olympics, complete with wrestling, tug of war and shin kicking, and followed by the Scuttlebrook Wake – a procession of colourful floats, imaginative fancy dress and maypole dancing. Just outside the town is the 18th century Gothic Folly Broadway Tower. Perched on the second highest ridge in the Cotswolds range (the highest is Cleeve Hill at 330m), it is one of the highest viewpoints in England and was once a popular holiday haunt for William Morris, the founder of the Arts & Crafts movement. Further south lies the market town of Moreton-In-Marsh a traveller’s town for more than 1,700 years. Situated on the Fosse Way, the old Roman road stretching from Exeter to Lincoln, Moreton-in-Marsh was granted its market charter in 1227 and still holds weekly markets almost 800 years later. Famous author J R R Tolkien is believed to have had connections with the town, with the J R R Tolkein Society claiming that Moreton’s Bell Inn was the inspiration behind The Prancing Pony Inn that features in Lord of the Rings. Nearby Four Shires Stone, which also sounds suitably Tolkeinesque, marks the convergence of the counties of Gloucestershire, Worcestershire, Oxfordshire and Warwickshire and hints at the size of the Cotswolds that unfurl further south. Following the Fosse Way south from Moreton-In-Marsh brings you to Stow-on-the Wold, where a settlement has existed since the Iron Age. Founded by Norman lords, it was made prosperous by the wool industry, which was later superseded by the horse trade. This tradition continues to this day, although the fairs at which the horses are sold every May and October have moved from the town square to a large field on its outskirts near Maugersbury. They remain so popular that the roads around Stow are blocked for hours. Further east between Moreton-in-Marsh and Chipping Norton lie the Rollright Stones, a stone circle probably dating back to 3000BC. Called the Kings Men, the circle of stones forms a late Neolithic ceremonial site. Standing 50m away is the separate King Stone, whose shape changed continually during the 19th century as drovers chipped off small pieces to act as lucky charms. The oldest stones can be seen at the Whispering Knights dolmen, a 5,000-year-old burial chamber believed to be part of a Neolithic long barrow. It is still a site of contemporary pagan rituals and its air of ancient mysticism has cemented its place in local myth. 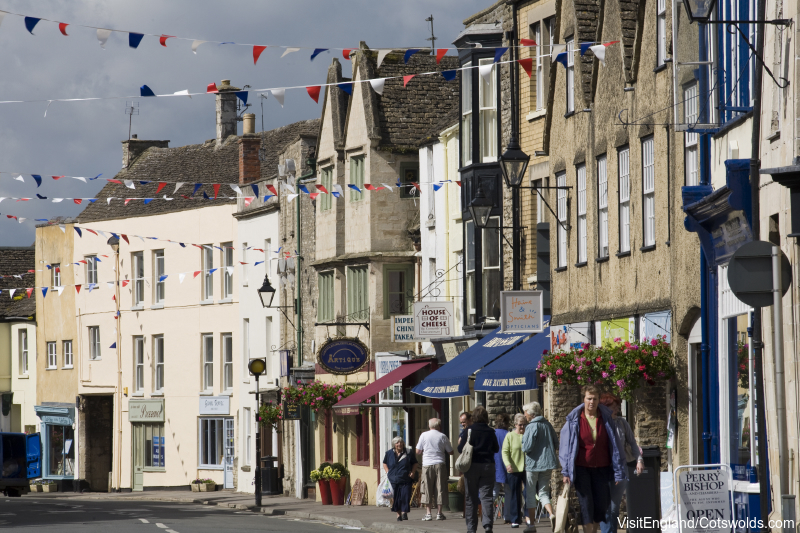 Visitors heading west from Stow will stumble upon Winchcombe, arguably the hidden jewel in the Cotswold crown. Its magnificent buildings still reflect its age-old prosperity built on its abbey (one of the largest Benedictine monasteries in England), tobacco production and, like many Cotswold towns, the wool trade. Though Winchcombe is relatively off the beaten tourist track, nearby attractions that offer an insight into the life of our forebears include Sudeley Castle, home to Queen Katherine Parr prior to her death in 1548; the National Trust’s Hailes Abbey, a Cistercian house founded in 1246; the Jacobean manor Stanway House, which has changed hands just once in the last 1270 years; and Belas Knap, a Neolithic long barrow site reputedly even older than the Rollright Stones. For the more mechanically minded the GWR Steam Railway winds its way through glorious countryside from Toddington through Winchcombe to Cheltenham Racecourse. Just beyond Stow are a trio of Cotswold gems. The Fosse Way heads south-west to Northleach, a small town with its impressive church of St Peter and St Paul – known as the ‘Cathedral of the Cotswolds’ – whose brook, or ‘leach’, runs through the town. No visit to Northleach would be complete without seeing the National Trust’s nearby Chedworth Roman Villa, recently reopened after a £3m refurbishment. One of the largest such sites in the country, it has a number of perfectly preserved mosaics, some of which were excavated only last year. 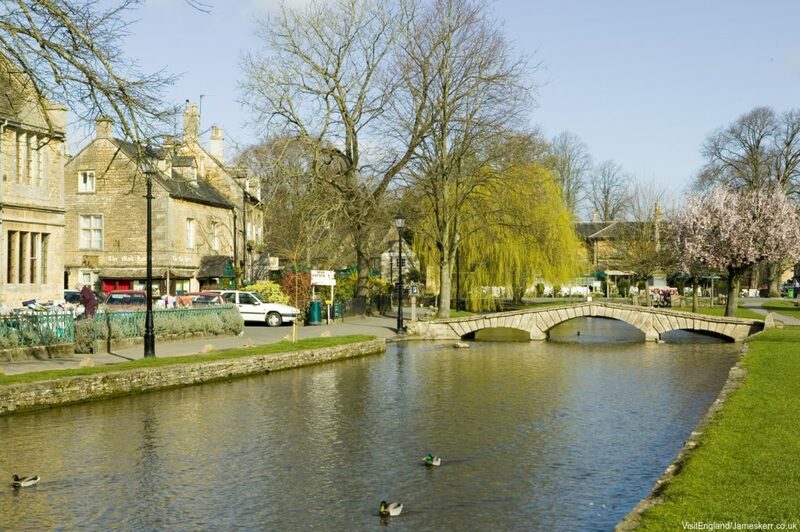 Despite being a village, nearby Bourton-on-the-Water has a larger population than the market towns of Burford or Stow and is famous for its picturesque high street. Another place with a fetching epithet, Bourton has become known as the ‘Venice of the Cotswolds’ due to its many low, arched stone bridges that cross the River Windrush. And like Venice it often has more visitors during peak tourist times than it has residents. The nearby Bourton Model Railway is another must-see for railway enthusiasts, boasting more than 40 British and Continental model locomotives working automatically on three intricately detailed displays. The Windrush flows on to nearby Burford, a pretty medieval town often called the ‘Gateway to the Cotswolds’. Like many Cotswold towns its houses, cottages and shop fronts appear to have changed little over hundreds of years. Off the high street, with its wealth of independent shops, galleries and tearooms, are a myriad side streets, alleyways and courtyards enticing you to further exploration. Close to Burford is the Cotswold Wildlife Park, a wonderful family day out where you can glimpse rare and unusual animals such as Purple-faced Langurs, Canadian Timber Wolves and Parma Wallabies, as well as a host of more common creatures. Nestling in the hills between Stroud and Gloucester lies yet another historic wool town, Painswick, built from the stone from the nearby quarry of Painswick Beacon, site of an Iron-Age hillfort known as Kimsbury Camp. Head to New Street to get a feel for the town’s history: despite its name the street contains the oldest building in England to house a post office while the Falcon Hotel there has the country’s oldest bowling green. The Norman church of St Mary has a beautiful churchyard with unusual tabletop tombs flanked by 99 yew trees – legend has it the 100th will never grow. Garden lovers should make a beeline for nearby Miserden Park Gardens, on the way to Stroud. Established in the 17th century and formalised a century later, it was further enhanced by renowned architect Sir Edwin Lutyens with the addition of an East Wing to the manor house. Open from April until the end of September, the gardens not only boast fine topiary, a walled rose garden and newly planted parterre but also memorable views of the surrounding Cotswolds. Lovers of the outdoors should head further south towards Nailsworth and the wonderful ‘lost landscape’ of Woodchester Park at Nympsfield. Here waymarked trails wind their way through a beautifully secluded valley and the remains of an 18th- and 19th-century landscaped park with a chain of five lakes, the last of which, Park Mill Pond, features a man-made island which is now a heronry. The sequence of glorious gardens continues the further south you travel through the Cotswolds, with Westonbirt Arboretum, Dyrham Park and Hazelbury Manor Gardens forming a chain of exquisite greenery to admire on the way to Bath at the foot of the AONB. In between, the pretty villages of Badminton and Castle Combe have very different sporting heritage: Badminton House, the principal seat of the Dukes of Beaufort since the late 17th century, is best known for its annual horse trials, while the Beaufort Hunt there has become one of the fox hunting events of the season. Unsurprisingly the sport of badminton was also reintroduced here from British India and popularised at the house. On the other side of the M4 corridor, Castle Combe sometimes competes with the motorway’s roar, the disused RAF airfield there having become the home of motor racing in the southwest. Yet, despite this occasional disturbance the village is known for its peace and tranquility, and for its fine buildings, including a 14th-century market cross and St Andrew’s church, which houses the Castle Combe Clock – one of the few working medieval clocks left – although nothing now remains of the Norman castle that gave the village its name. The Cotswolds Conservation Board recently made a public appeal to help compile a list of ‘Seven Wonders of the Cotswolds’, a request that has fired the imagination of people who live or visit here. 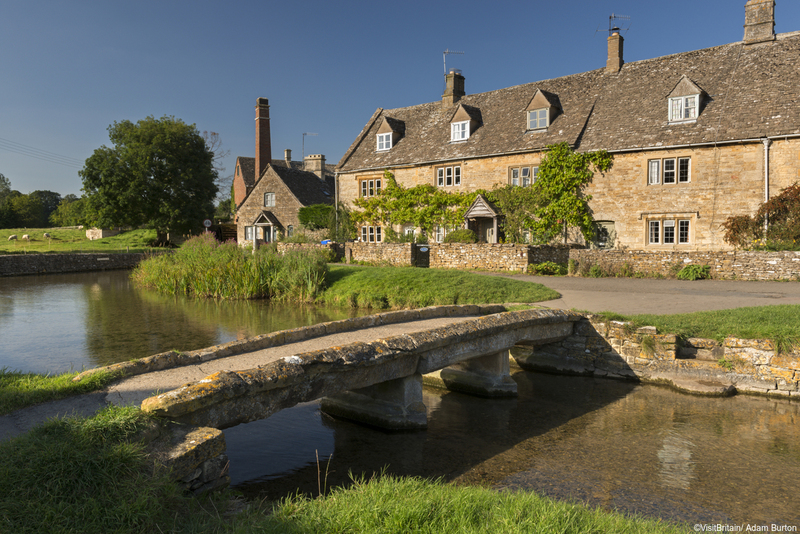 With an abundance of ancient and historic sites, breathtaking parks, woodland and gardens, and the mellow beauty of its towns and villages with their honey-coloured buildings, the board will have great difficulty whittling the Cotswolds’ many wonders down to seven.